This time it's a Canadian genealogy survey by students at Carleton University in Ontario led by Professor Leighann Neilson, Sprott School of Business and Emeritus Professor Del Muisse of the History Department. I've already submitted my answers, and yes, I knew right away I couldn't agree with some of the broad assumptions apparently being made. Has there been a recent "surge of interest" in genealogy/family history as the Cape Breton Post put it? If so, when, where and what forms has it taken? Or are some paying more attention to television ads than perhaps is wise. Remember how long the widely heralded show 'Who Do You Think You Are' lasted in Canada? Are libraries and archives and museums reporting more visitors doing family history and genealogy? I would be very interested in those statistics myself. 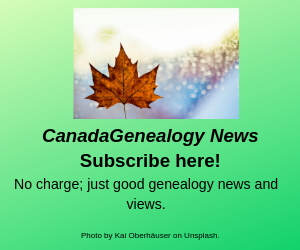 It's true, I think, that over the last few decades some institutions have started to pay more attention to their users, and some, like Library and Archives Canada (LAC) now realize we genealogists and family historians are their largest group of users. 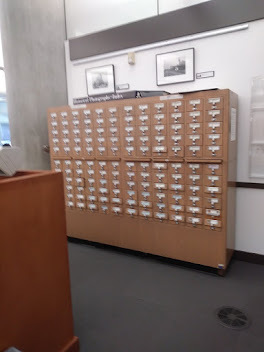 But wait, almost everywhere I go, services, on-line and off, are being cut back, and that's certainly true at LAC, as well as at local archives and libraries. This survey is partly concerned with the mix of on-line research and on site research we do. For most of us, I think this is an 'it all depends' question. Research goals and timelines, finances, convenience, availability, and just how determined (or desperate) we are to track down the evidence all play a role here. If there is an upsurge in interest, but fewer of the services we've all depended on for Canadian research are available, that could lead to more commercial genealogical opportunities. Not something I think most Canadian genealogists and family historians really want to see, particularly if it's at the expense of volunteer and community organizations. Still some of the information collected by these students could be useful to the genealogical community so I hope you will take the time to fill this out. This on-line survey was originally tested in Nova Scotia as the Cape Breton Post explains, but now all Canadian family historians and genealogists are invited to participate no matter where they are researching their families, as long as they're over 19. They seem to be welcoming comments. Suggestions for the bibliography they've been compiling would seem appropriate since there doesn't seem to have been any review of the genealogical literature yet, and up to date DNA genealogy references are lacking. Diane, I too had some reservations about "broad assumptions." The "surge of interest" has been building for many years (as you mention, surely archives and library statistics reinforce this) but of course more recent TV programs and commercials contribute to it. 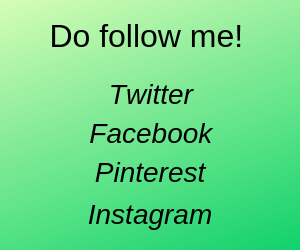 I was disappointed that the list of research sources was standard fare, but have to remember that they want newbies as well as experienced family historians to respond. Granted they have a broad philosophical(?) sort of goal, but overall, I'm not convinced that they are tuned into the real world of genealogy. Their bibliography to date seems geared to such a pan-scholastic approach with little or no relation to real-time developments (but of course we are invited to add and should do so ...).